With the fulfillment of having a furry friend or two around to make your home more welcoming and warm comes also the responsibility of looking after them. And ninety-five percent of that, oftentimes, feels like a whole lot of cleaning. Be it all the shedding, unattended litter boxes, dogs having a little accident or your cat throwing up on the carpet you scrubbed down just yesterday, a pet owner’s greatest grievance isn’t even cleaning up the mess, sometimes – it’s those lingering, unpleasant odors that hang around even after you all but disinfect your whole house. There’s a simple solution, though – odor eliminating candles. We’ve put together a list of our favorite candles for the job, which not only neutralize nasty odors, but also make your home smell divine. With 15 charming scents, from apple cider to lavender green tea to vanilla crème brûlée, these candles are built not just to mask that ‘pet smell’ that often makes us wary about having guests over, but actually neutralizes any nasty malodors. Formulated with top of the line fragrances and essential oils, these candles subtly scent the air, leaving behind a pleasant aroma that is clean without being too overwhelming. Not only does this make them excellent smell eliminators – not just for pet odors but also to get rid of the smells of cooking, smoking, and so on – they’re also made to be completely eco-friendly. The soy wax is much more sustainable than paraffin, and also cleaner when it burns as it doesn’t spew out any toxins, excess soot, smoke or other pollutants which might be harmful to your pet as well as the environment. The wick is a sturdy, braided cotton construction which won’t come loose or undone, and the candle itself comes in a tasteful glass jar that can be reused once the wax has been used up. As soy burns cooler than paraffin, you can also expect this candle to last for up to 60-70 hours. Offering a range of a whopping 34 scents to choose from, going from florals to fruits to desserts, these 13 ounce candles are endorsed and sold by veterinarians themselves for their incredible effectiveness in tackling pet odors without breaking the bank. A combination of paraffin and soy, these candles burn cleanly, releasing enzymes which attach themselves to the odor-causing molecules and effectively neutralize them. 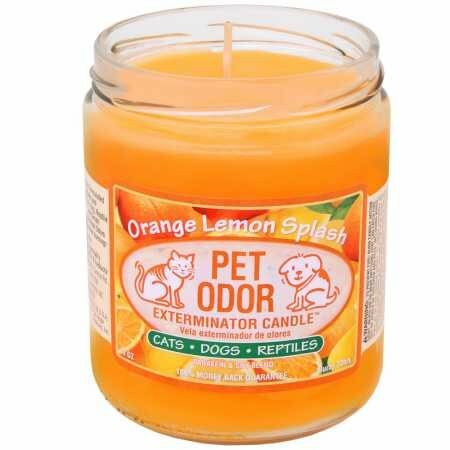 Perfect not just for getting rid of that nasty ‘wet dog’ smell or the incriminating evidence of your cat’s lunch barfed back up somewhere in the house, these candles also nicely cancel out fumes, smoke and other unpleasant smells, leaving your home pleasantly fragrant in their stead. These charming odor-eliminating candles are not just effective, but look gorgeous as well. In apothecary-inspired glass jars with vintage styled labels, the candles fit seamlessly into the décor of any room without attracting attention to the fact that they’re there to cancel out any malodors your pets may have left about the place. Handmade out of a 100% natural soy for clean-burning and sustainability, and including no artificial dyes, these organic candles are not only endorsed by vets but also boast honorable mentions in Cesar’s Way Magazine and Modern Dog Magazine. 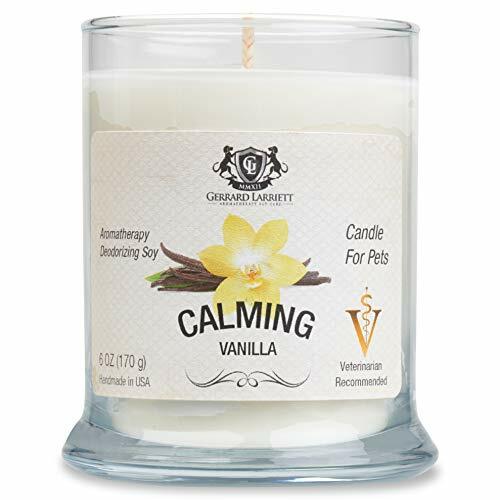 Available in seven, charming scents and infused with natural essential oils such as grapefruit, lavender and peppermint oils, often used in aromatherapy, these candles not only tackle any lingering stench left by a pet-related accident, but also help soothe and relax you when lit, acting as subtle mood-lifters. Burning cleanly and slowly compared to paraffin alternatives, one 6 ounce jar can last an estimated 40 hours. A clean-burning, professional-strength candle made of paraffin and soy wax, this candle will scent up your room without even being lit. Powerful and formulated with odor-cancelling enzymes, the candle’s scent, a subtle mix of musk, spice and tropical fruits, easily wafts through your entire home, without being too overpowering or overwhelming. 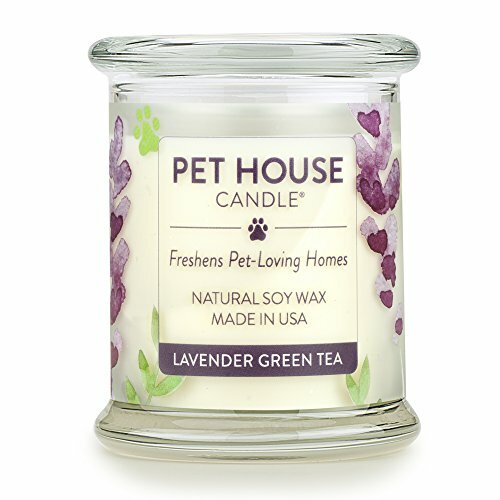 Endorsed and sold by vets, these candles have also been used at pet hospitals to maximum effect, completely capable of neutralizing any odd smells hanging around because of your dogs, cats, rabbits, reptiles or other pets. A 13 ounce jar can last for up to 70 hours of burning. Burning candles indoors, especially with a playful pet around, can be risky business, and not just because of the fire hazards. Paraffin, derived from the non-renewable and highly polluting resource of crude oil, is not only unsustainable but also generates harmful by-products like toxins and carcinogens, which are as bad for the environment as they are for your pets and yourself. Candles made of natural soy wax, or a combination of soy and paraffin, are much better alternatives, and for numerous reasons. Soy is a renewable, safe resource which burns cleanly, without adding pollutants to the air, as well as burning more coolly than paraffin, allowing soy-based candles to last much longer. Because soy burns slowly, it also gently and subtly wafts out the scents infused into it, rather than releasing a strong blast of the scent from the get-go. Capable of holding scents much better than paraffin candles, which sometimes have an underlying chemical scent both unpleasant and harmful to have trapped in your home, these options are perfect not only to neutralize bad smells but also add a little pleasant ambience to your home. When it comes to pet odor, masking the scent with a simple air freshener or scented candle is not enough. 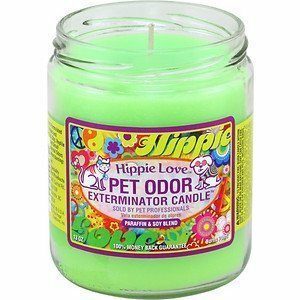 Pet odor eliminating candles generally come with an enzymatic formula designed to completely cancel out the stench having a pet around indoors can sometimes lead to. It’s important, therefore, to look out for candles designed to have this specific feature, since scents which merely mask can just end up mingling with malodors and make the place smell worse. A great rule-of-thumb guide for picking out candles safe for use around pets is to see if the brand is endorsed or sold by vets themselves. Candles between 6 to 13 ounces, promising longevity, and coming in reusable containers – mostly glass that makes it easy to clean up any soot that accumulates and safe to hold burning candles – are indicators of decent quality as well.